RACINE, Ohio — Ready to kick up a storm. At a recent meeting, the Southern Local School District Board of Education approved the hire of Cassady Willford as the varsity football coach. Willford will be replacing his high school coach, Mike Chancey, who in two seasons led the Tornadoes to a 15-6 record and the program’s second-ever postseason appearence. 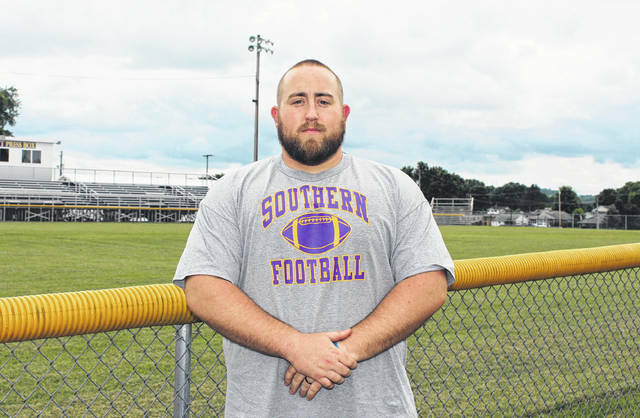 Southern shut out four opponents, while going 4-0 in regular season non-conference games in Chancey’s two years with the Tornadoes. The Purple and Gold were 7-3 on the gridiron last fall, with two of their three losses coming to playoff teams. Willford is a 2008 graduate of Meigs High School, and a 2012 graduate of Heidelberg University, where he played four years of football. He was a four-year letter winner and a three-year starter on the offensive line for the Student Princes. For the past six seasons, Willford has been an varsity assistant coach for at Meigs, helping the Maroon and Gold to a 29-31 record. Willford was the Marauders’ offensive coordinator for the last four seasons, and was offensive play-caller for the last two campaigns. In Willford’s tenure as offensive coordinator, Meigs averaged over 28 points per game and scored 40-or-more points a dozen times. “Give credit to Coach (Mike) Bartrum, he really helped me out by letting me call plays as the offensive coordinator the last two years,” Willford said. “It helped me out a ton, learning from him what he brought to the game, and the other coaches that he had on his staff. Willford won’t be detached from Meigs completely, as he will head into his sixth season as MHS wrestling coach this winter. Although Willford and the Tornadoes are just days into summer workouts, the leader of the Purple and Gold is already impressed by his squad. Willford’s support staff will include former Meigs assistants Rick Olexa and Paul Dailey, former Southern assistants Jason Circle and Nick Stevens, as well as former Tornadoes quarterback Blake Johnson. “Coach Rick Olexa will run my defense for me, he was the defensive coordinator at Meigs for the last few years,” said Willford. “Paul Dailey helped out at Meigs a couple years ago, he’s now coming with me to help Coach Olexa with the defense. The Tornadoes will open the 2018 season at the friendly confines of Roger Lee Adams Memorial Field, where they will host Portsmouth Notre Dame on Aug. 24.